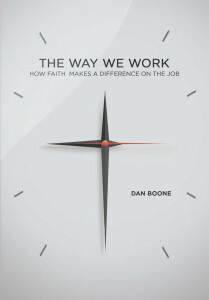 I’m so excited to announce the release of my new book, The Way We Work: How Faith Makes a Difference on the Job . July 1 marks the official publication date. Would you like to win a copy of my new book? We’re holding a giveaway here on the blog from now until July 7 at 11:59 p.m. central time. Enter below, tell your friends, and then come back daily for an additional entry when you Tweet about the giveaway. And if you’d like to go ahead and order a copy of the book, it’s available on Amazon. You can also download sample pages and order it from my publisher, Beacon Hill Press. I just finished submitting the manuscript for my next book. It is titled, The Way We Work: A Christian Theology of Human Labor. I find myself thinking these days about the work we do on a Christian campus. The work is challenging, formational, never-ending, and future-making. I think our God is vitally interested in the spiritual formation and maturation of the next generation of Christians, especially during the years that they are most prone to leave their childhood faith. So to answer my own question, I am thankful for meaningful work to do at Trevecca. We are participating with God in creating the future. And I am also thankful for friends like you who make this possible.